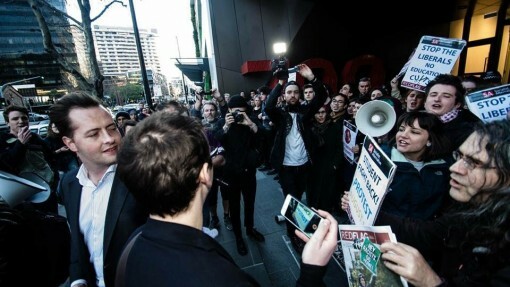 Yesterday evening myself and fellow Liberals tried to enter Christopher Pyne’s book launch at nab’s headquarters in Melbourne. When we arrived we were greeted by dozens of so-called “student” protesters. After taking some photos of the rabble, we tried to approach them to get through to the entrance, however their locked armed stopped us from entering. Trots stopping me from entering Pyne book launch in Melbourne, disgusting physical behaviour. We then approached one of the leaders, who was holding a megaphone, to ask them to make some room for us to enter the building. The gentlemen recognised me, and then agreed to help us get in. However, instead of keeping to his word, he made an announcement that “Matthew Lesh, a senior Young Liberal” was in attendance. That’s when I started recording their activity (see video above), which included chanting “f*ck off Liberal scum” to my face. We then once again tried to enter the venue, however were stopped by the same people screaming at us. Luckily we were able to make it inside through an alternate entrance upstairs. Once we were inside we witnessed the protesters attempt to push their way through the upstairs entrance. The police were forced to physically hold them off. The protesters pressure came to break one of the panes of glass on the building and injure five police officers. Their activity was absolutely disgusting on every level. Violence, intimidation and agression are no way to make a political point. One thought on "My entrance Christopher Pyne’s book launch"
What digusting scummy people. Clearly they have no idea how moronic their chanting is.